Ask The Bellwether: How do you get 4 oz. of fiber onto one spindle? How do you get 4 oz. of fiber onto one spindle? Hi! I've a new job that is generally keeping me quite busy, but I still get to think about and touch fiber every day in my studio, so no complaints, and the steady paycheck makes up for not having an 'all fiber, all the time' life any longer! An interesting question came across "Ask The Bellwether"'s comment feed the other day: "What I need to know and I hope you can help me, is: if you are spinning 4 oz of fiber and plying on the fly with your spindle, how do you get all 4 oz of the fiber on the spindle?" First you want to be spinning a thickness of fiber that can support the 4-6 ounce weight of spindle-plus-fiber; so you aren't going to be spinning laceweight and doing this, as it just won't support the mass. I would aim for a single that is about sockweight for this, if you truly want your 4 ounce goal. Second, you need to have a spindle that can store that amount of fiber on it. How do you know? Well, if it's top whorl, you will want a fairly wide whorl, say 3" across if you can get it, at least 2" across; and a longish shaft. That's because you are going to be storing all that yarn on the shaft under the whorl, and the cop (the wound yarn on the spindle) has to be no wider across than the whorl, or you run into other issues. If it's a bottom whorl, the long shaft is still necessary, but the whorl size isn't as important. For a Turkish spindle, you need long spindle arms so they poke out from the ball (unlike this little Turkish whose arms end inside the yarn ball). Third, as you wind the cop onto the spindle, you need to keep it balanced. The spindle will get all wobbly and not fun to spin if the cop is not balanced, making you want to end the project right away. If I were to work on this as a goal, I would start with a spindle that was about an ounce in weight, with a wide whorl or long arms, and a shaft length of at least 9-10 inches. In fact, I do have a ply-on-the-fly project going right now on just such a spindle, but I am going to split it into two 2-ounce balls, as the singles are fairly fine so that the 3-ply can be sock-to-DK weight yarn (about 14-16 wraps per inch). I don't think that we have to get a whole braid of fiber onto a spindle to be successful; there are plenty of uses of fiber that tolerate breaks in the yarn. With knitting or crochet, Russian Joins or even other clever knitting joins are out there for making this feasible, and weaving and needlepoint are even more tolerant of breaks, expecting them in due course. 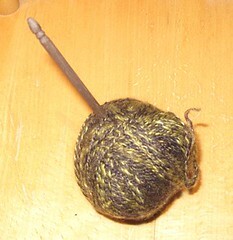 How much yarn can I spin on my spindle? When is the spindle full? How much yarn can you wind onto a Turkish spindle?